LANGLEY, B.C. -- The SPCA has seized 66 sick, injured and malnourished dogs from an alleged puppy mill in Langley, B.C. The society says the seizure last Thursday is one of the largest in B.C. history. Thirty-two adult dogs and 34 puppies are now being treated for everything from broken limbs and missing eyes or ears, to infections, abscesses, and psychological issues. 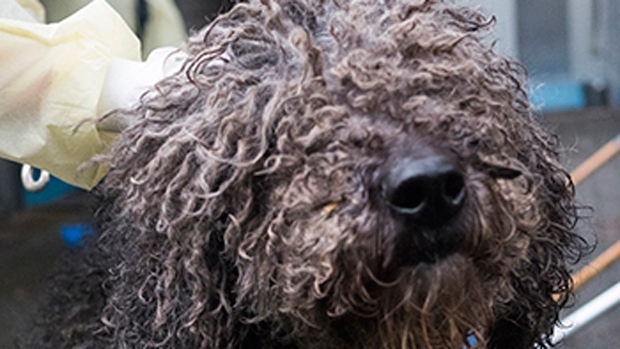 Breeds seized at the Langley site include Old English sheepdogs, Bernese mountain dogs, soft-coated wheaton terriers, standard poodles, miniature poodles and Portuguese water dogs. Society spokeswoman Marcie Moriarty says all the animals were kept in deporable condition in small, stacked crates and cages and many of the dogs are fearful from lack of socialization. Moriarty says the SPCA is preparing its report to the Crown and is recommending criminal charges.